I always get saddened when an anime starts off so strong, but slowly deteriorates from episode to episode. In my view, Guilty Crown fell victim to that. 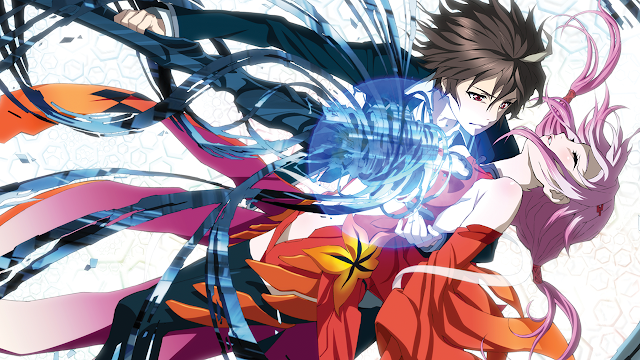 Guilty Crown started of very strong, I was well invested and loved watching during the first half of the anime. But then there came a point where it just became a bit unlikable. However the last few episodes did sort of save the anime in a way. Ten years ago on a day labelled "Lost Christmas," a wildfire spread illness known as the "apocalypse virus" debilitates Japan and it's people to the core. Fast forward to 2039 and Japan is now governed by the GHQ due to the aftermath of the apocalypse virus where the people of Japan have given up their rights and freedoms and have allowed the GHQ to "restore" order to Japan. As more find that the GHQ is corrupting Japan, a resistance group known as the Funeral Parlor go after the antics of GHQ members during appropriate situations. One day a pink haired girl named Inori, who works with the Funeral Parlor, steals a powerful tool known as the Void Genome from the GHQ. As Inori is being pursued by GHQ members, a boy named Shu enters the picture and accidentally acquires the power of the Void Genome allowing him to pierce into people's hearts and extract powerful weapons. And the story goes in all sorts of directions from there on. I feel like the story is so overwhelming that it's hard to crunch it down into a few sentences. It's sort of like watching an anime where you have to pay really close attention and extract certain clips in the anime and put them together like a hard jigsaw puzzle. Which is how I felt while watching Guilty Crown and what I also believe is one of the downfalls of the anime. There was just too much thrown at you and if you really wanted to understand the anime you would have to link certain moments to a string of others. Which I don't like...haha. Now don't get me wrong, it sounds like I'm bashing Guilty Crown down to bits. I really enjoyed the first half of the anime. The first half of the anime was where I found it hard to piece certain plot points together. However the action scenes, the animation, those damn cliffhangers and the fight scenes were amazing. The second half of the anime was where I had most of my issues. Some of the characters were fun to watch, but there were others like Shu and Yahiro just crawled under my skin. Shu didn't really have a personality, he was too self doubting and had no self direction. And to have the power of the Void Genome and not be a strong figure, that's not the best combination to watch. Inori on the other hand, although very aesthetically pleasing, was basically a rag doll following either Gai or Shu. My issue with Shu really starts to kick in during the remaining half of the anime where it was difficult to watch. It's the part where a certain part of Japan gets secluded and Shu lets the people around him dictate his moves. He pretty much becomes a Slaine Troyard from Aldnoah Zero or a Rossiu from TTGL, and when I started to realize that Shu became these people I was like, "oh lord here we go... I'm not here for this." As for Yahiro, his manipulative, conniving and backstabbing ways reminded me of Noumi from Accel World. Yahiro did not make my blood boil to the point where Noumi did but Yahrio did rub me in the wrong way. Not always fun to watch this guy. So other than that, and besides those issues, I really enjoyed the anime. I thought the animation was pretty solid; I liked watching the animation when Shu grabbed a weapon out of somebody. I thought the fight scenes were exceptional and exciting to watch. The OST was another strong point in the anime. Some of my favourite tracks from the OST was bios, that song became my favourite when Shuu took Ayase's void during that escalator scene. That's it for this review, sorry if I upset any Guilty Crown fans, these are just my opinions. Please comment down below and tell me what you think of Guilty Crown!